Seventy-two hours is the time it takes husband and wife owners Takumi and Miki Marui to prepare the pork ramen ($15) at their beloved home-style Japanese restaurant. Why? Because it tastes better. The sliced chashu is smoky, the broth is rich, but not too rich that you won't finish the bowl (which is their intention), the noodles perfectly chewy and the marinated soft-boiled egg makes it a ten out of ten dish. But that's not the only reason why locals adore this small Canterbury Road eatery. People come here for the quality of food and the ever-changing daily specials that range from tuna belly to sea urchin. It's certainly up there with the best of them, but you'd never know it from its humble appearance. It's well-hidden behind a skinny roller door by day on one of Sydney's busiest roads — you'd walk straight past it if it weren't for the lights illuminating the full house on any given night of the week. The decor is minimalist with a few pieces of hanging art and some colourful seat cushions to brighten the space, while a makeshift curtain tied to one side of a doorway is the only thing that separates you from the talent in the kitchen. Curiosity will get the better of you, but trust us when we say it's going to be good no matter what you order. Grab your pen and order paper, and start writing down dishes like the karaage chicken ($12) with house-made tartare sauce. It's hot, juicy and tender — the way fried chicken should be. Small plates like handmade gyoza ($10), assorted sushi and sashimi ($16) are always fresh and served elegantly on the plate. 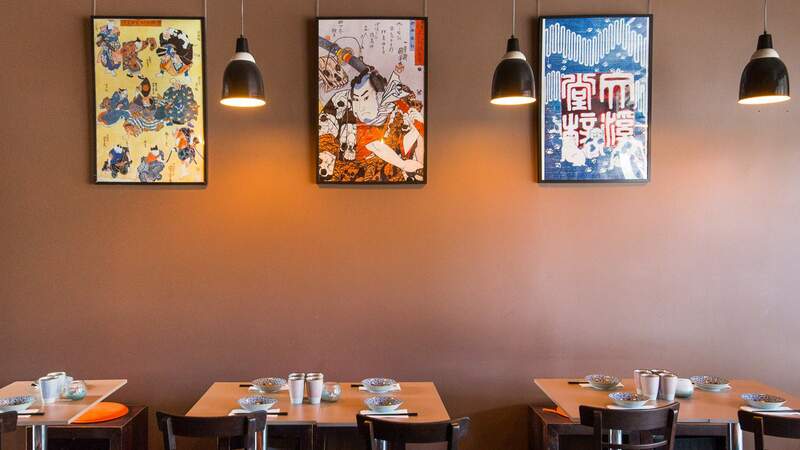 And classics like the chicken donburi ($14) and pork katsu curry ($15) are packed with so much flavour, you'll want to personally thank the chef before you leave. Just don't expect your meals to come flying out of the kitchen. With so much preparation and love going into each and every dish, meals stagger out of the kitchen one by one per table, so you'll have to be patient while you sip your tea, but we guarantee it'll be worth the wait. Make sure you book a reservation before you go, because the restaurant can shut up shop at the last-minute. And if trying to find a car space in the area is more than you can handle, the Japanese fare is only an Uber Eats click away 'til the wee hours of the early morning.